At least one spouse must live in New Jersey for a year before you can file for divorce. If you and your spouse have problems you can't resolve (i.e. irreconcilable differences) that have caused the breakdown of your marriage for at least six (6) months, you have met the requirements for a no-fault divorce in New Jersey. You receive all of the NJ divorce forms completed and ready to file. You sign and file the Complaint for Divorce along with related divorce documents. Your spouse signs and files the remaining documents. Your divorce is finalized when a Judge signs the Final Judgment of Divorce. 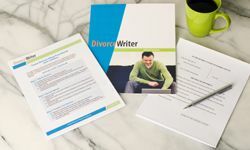 DivorceWriter provides forms specific to the state of New Jersey and offers a money back guarantee if your documents are not accepted by the Court. You have qualified to use DivorceWriter to complete your New Jersey divorce papers online. Select "Continue" to start the interview.